Much to the chagrin of my teacher wife and everyone else starting their fourth week of school here in South Carolina, the district I attended in Spokane will hold its FIRST DAY OF SCHOOL today. This is not an oddity or a one year thing. School always starts the day after Labor Day in the Mead School District. Although the three of us Reser kids have long since graduated from Mead High School, there is still a Reser in the building. My mom began her 15th year working at Mead this morning. Although not a principal, teacher, or coach, she still holds a very valuable position at the high school. If you know enough about an education system to immediately understand what my mom does when I say the word “paraeducator” then good for you! However, if you are like most of us, a quick explanation is necessary. A paraeducator is an individual who assists in a classroom. He or she usually serves as an aid for the actual teacher. The individual will teach small groups, accompany the class to specialist periods (such as PE), do one-on-one work, give backup to the teacher, and perform a myriad of other tasks. So yes, my mom is a paraeducator. But there is one more thing I should add: She is a paraeducator in a special education classroom. 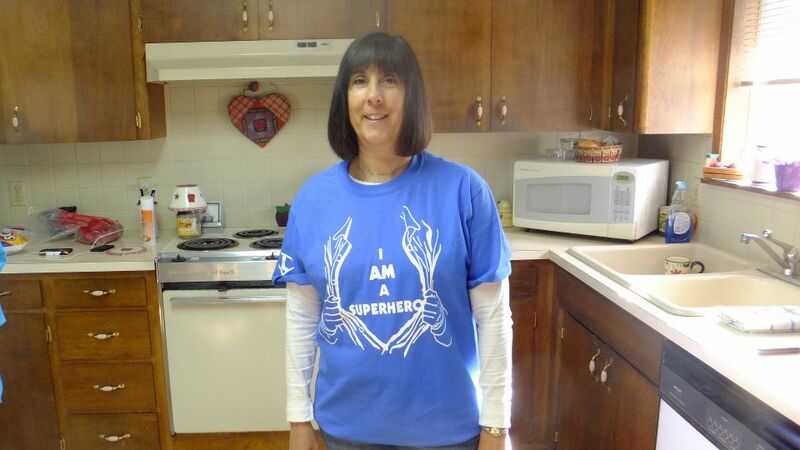 It is true, my mom is a superhero! This was her a few years ago right before the Special Olympics for the class my mom works in. Today she begins her 15th year at Mead High School. For 15 years my mom has helped make the days of high school special needs students a little brighter. She has cared for them and taught them day in and day out. She has used the patience and warmth she bestowed on the three of us kids growing up in the same way with the students in her classroom. My mom’s job is not easy by any means. Believe me, she doesn’t do it for the pay. Rather, she does it because she has an amazingly kind heart and the desire to make a difference. You can probably gather that my mom is good at her job. But do you want proof? All you have to do is look at her biggest admirers. On my few trips back home, it never fails that a past parent will come up to her at the grocery store to strike up a conversation. Their appreciation always shines through and it is incredibly apparent that they hold inside themselves a large amount of gratitude for the warmth my mom gave their son or daughter. I hope you have the best school year yet, mom. Please know that our family is so proud of you. Don’t Blink. This entry was posted in Uncategorized and tagged Mead High School, Mead School District by brent. Bookmark the permalink.